Whether youre running a 15-person workshop or a 400-worker factory, you should know before buying whether a piece of equipment will provide an adequate return on investment (ROI). In other words, “Is this going to pay?”. Business people look long and hard at their choices before acquiring an expensive piece of equipment for their companies. Price, quality, ROI, level of technology, and durability figure into their decisions. The size of its footprint may be pondered, as well as the learning curve for its future operators. What follows is a general exploration of the options that may be available to small and large jewelry companies — depending on their financial standing and track record. om Dailing works in metal and Richard Homer in stone, but otherwise they are very much in sync. 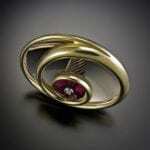 Dailings jewelry designs win prestigious awards. So do Homers cut gemstones. Both have a passion for exploration and innovation. Both love to spend hours pondering their next creative direction-preferably to somewhere no one has been..